Pamala's daughter? Yeah, remember the movie 'Gone in Sixty Seconds?' 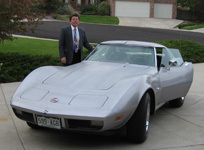 Pamala was the '53 vette that was heisted. 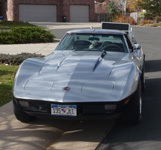 Here's a few shots of my 1973 Corvette Big-Block 454. It's been "in the family" since 1980. I'm finally getting around to making it new again. So far, the engine has been rebuilt and it runs great. My thanks to my friends at Texaco in Lakewood. 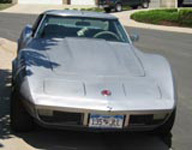 They really have assisted me in the restoration of my beautiful vehicle. Stay tuned as I'll have a complete history of the paint and body work that was done by NEW CUSTOM AUTO PAINTING in Pine Junction, CO. We've taken a lot of pics. Next up? Winter interior project? Ok, it's December 2008 and my last trip to visit my friends in Grand Junction have revealed what I believe to be a bad bearing on the left rear. My guys at Texaco at first thought that it was a u-joint of the rear axle. After a little more inspection, I won the vote! It was a rear axle bearing on the right. Everything is well at this point. It's only money and time!!!!!!! !My wife thinks that I'm nuts. 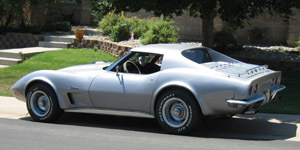 However, the money that I put into my Vette is probably a better investement than our 401Ks! I know, it's hard to believe for a real world but our real world is not as it used to be. 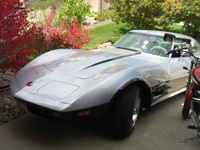 People are impressed that I have owned this car for such a long time........It's the only car that nither of my sons have driven---You do the math!......All of the rest are crushed! Maybe when it's time for me to turn in my license?.... Not! So what in the world do you do when your grocery hauler breaks down and you have a music gig? 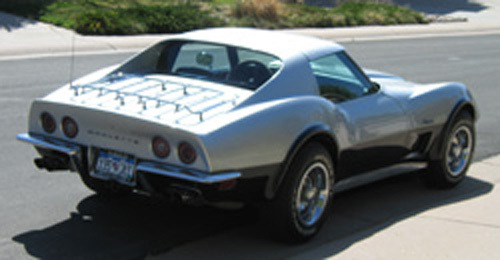 Be glad that you have a custom trailer hitch on your vette. I had my paint/body guy build a custome hitch for me during the paint session. It wasn't cheap but it looks great and works like a champ! 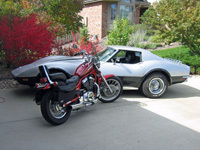 I got the idea from a friend who owns a Plymough Prowler. He says that the trailer hitch was the only option for that car. BACK TO WHERE YA CAME FROM! Copyright 2000-2008 © Dan Johnson. All rights reserved.